Yesterday, DPReview published Canon EOS 5D Mark III low-light ISO series samples: images taken at different ISO under low light conditions (3000K halogen light ~3EV). The photos were JPEG output directly from the Canon EOS 5D Mark III with default camera noise reduction (NR) settings. I downloaded the full size photos and viewed the images in whole on my 24″ display (at resolution of ~1570×1043) and the lack of noise was astounding. There is no perceivable noise up to ISO 6400. Only slight hint of noise at ISO 12800 and obvious noise at ISO 25600 and higher. 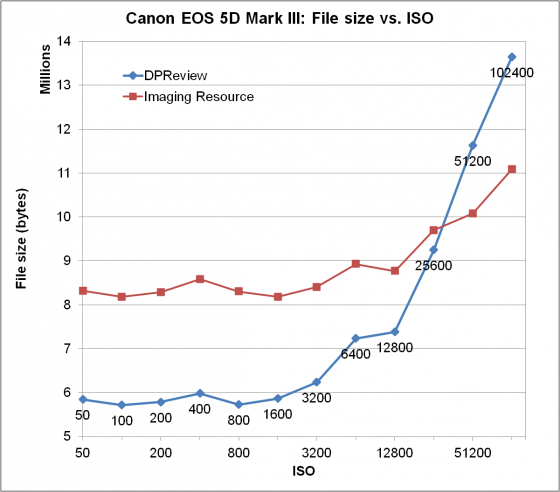 Did Canon improve the sensor ISO noise performance or did Canon improve their noise reduction algorithm in image processor? Images that are free of noise are going to have smaller file size compared to images of the same scene but with more noise. We expect the images to contain more noise as ISO is increased so we expect the file size to increase with the ISO. If there is noise reduction applied, the file size will decrease. 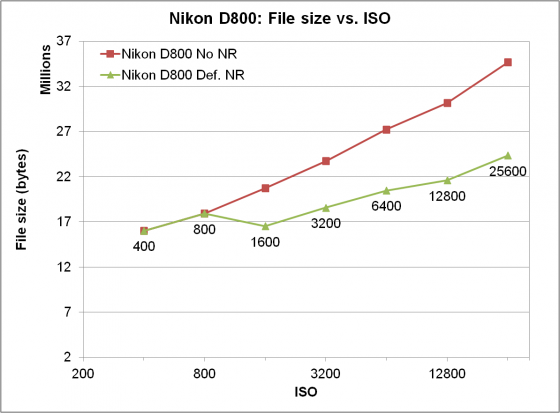 The following is Nikon D800 JPEG (100% quality) file size vs. ISO with and without NR. The JPEG files were exported from Capture NX 2 once with NR turned off and a second time with default NR left untouched. The default NR settings (tagged by camera in the NEF files) are: ISO 400: 0%, ISO 800: 0%, ISO 1600: 3%, ISO 3200: 5%, ISO 6400: 10%, ISO 12800: 20%, ISO 25600: 32%. The files are the same as the ones we used here. 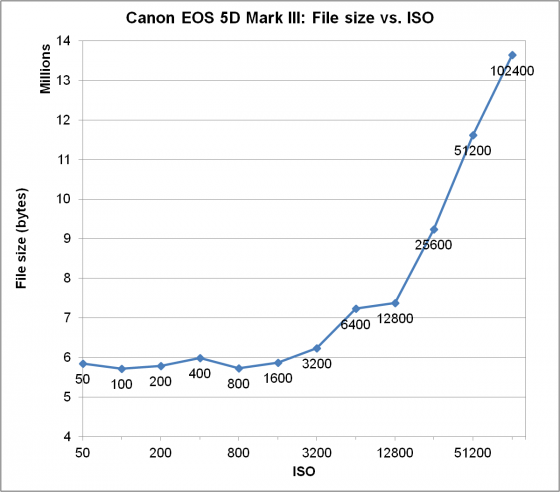 The following chart shows the file sizes of Canon EOS 5D Mark III images from DPReview as a function of ISO. If the file size at certain ISO isn’t larger than the previous one or doesn’t increase from the previous ISO setting more than the increase at lower ISO setting, noise reduction is likely applied. Did the camera apply NR at ISO 100 since file size at ISO 50 is slightly larger than that of ISO 100? It is hard to imagine this is necessary. ISO 50 image appears to be brighter than the ISO 100 image. The slight increase in brightness might have brought out some additional details somewhere, causing the slight increase in file sizes. The image engine inside Canon EOS 5D Mark III does a good job. There are definitely loss of the details when viewed at 100% but the loss mostly occurs at fine detailed area which may not be an issue depending on the output size and media. Some cameras may not have such a good noise reduction function in their image processor, but noise reduction in post processing has been greatly improved. For RAW shooters, the noise reduction function in image processor is not relevant since it is for JPEG and TIFF outputs only. At a colour temperature of about 3000K and low light intensity (approx 3 EV), these images are also neutrally white-balanced. This requires extreme amplification of the blue channel (and to a lesser extent the green) relative to the red, accentuating any noise or banding that might be introduced by the camera. This should therefore be considered close to the worst-case scenario – under many situations you’ll see less noise at high ISOs, for example when shooting indoors in daylight. Perhaps what they claimed has some merits but at the same time they chose to shoot a scene that in general lacks fine details and consists most of uniform colors and smooth textures. It is difficult to evaluate the trade-off between noise and details. The best spot to see what NR does to the detail is the weird creature in the lower left corner. 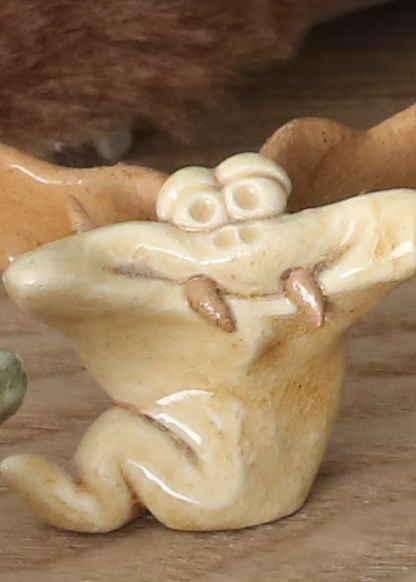 The following 100% crops show how some of the details that are visible at ISO 100 disappear at ISO 1600 and ISO 6400. Imaging Resource published a set of Canon EOS 5D Mark III samples. The overlay comparison of both DPReview and Imaging Resource sample photo file size vs. ISO showed very similar trend. Based on this data, the image processor applies a low level of NR between ISO 100 and ISO 400, moderate level between ISO 800 and ISO 6400, and high level at ISO 12800 and higher. The following is the Raw image size vs. ISO. 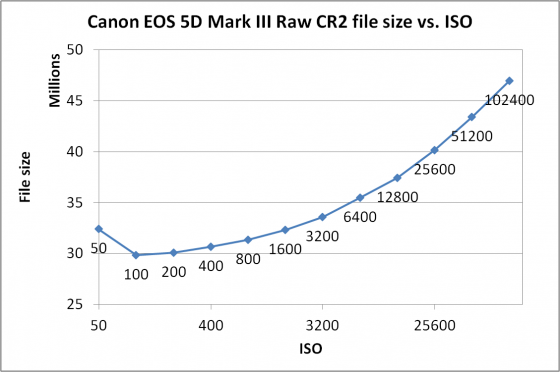 Canon CR2 raw format is a compressed format. The trend is more consistent with the expected behavior. ISO 50 file size looks a little strange.